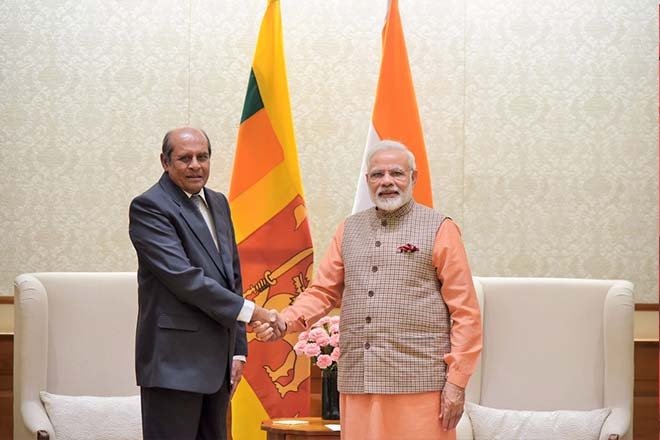 Sept 11, 2017 (LBO) – Sri Lanka’s Foreign Minister Tilak Marapana met with Indian Prime Minister Narendra Modi to convey greetings of Sri Lanka’s President and Prime Minister, a statement said. Modi stated that Marapana’s choice of India as his first overseas visit is a reflection of close partnership between the two countries. At the meeting between Marapana and the Indian External Affairs Minister Sushma Swaraj, held at the Hyderabad House, the official venue for high level meetings, the two Ministers discussed all matters of mutual interest and in particular the implementation of economic cooperation projects.